I have been thinking of a way for you all to join in on Saturday Stirrings. Besides inviting you over for dinner. Which really could send me over the edge. And force me to clean my cheap linoleum. Plan B is much better, I think. 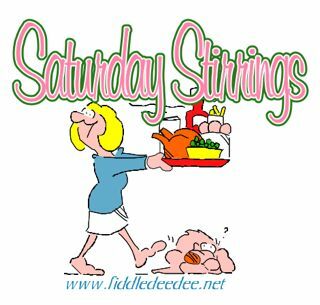 I’m working on setting up a Mister Linky thingy (a technical term) so that you can link to my post on Saturdays with your own Saturday Stirrings recipe, or kitchen recipe tip. This sounds simple. However, you know how technically inclined I AM NOT. But, I’m muscling my way past the fear, and going for broke. I made the graphic for “Saturday Stirrings” myself. I KNOW! My husband made me do it. Something about how I need to learn the technical aspect of my own blog. Anyhoo. Feel free to use it if you like. I’m hoping that tomorrow (Saturday) will be my first attempt at this. If I don’t blow my own blog up. Fingers crossed, while I hide under the computer table. Hey! I actually know how to save your graphic and put it on my own blog when I post a recipe for you. Is that how that works? I am still a chicken when it comes to technical things. Sorry! Don’t make me seem the Frog Army to get it. I’ll explain the whole Mr. Linky thing Saturday. It will make more sense if you can see it. If I still have a computer…..
I’ll spill my guts. I pretended like I was making a card using my Print Explosion program, then I took a screen shot, and cropped it, and voila. I may have cried on my first five attempts. But other than that, piece of cake. You are braver than me, I have barely got just the basics of posting down. It really shocks me how much of a struggle this has been for me, until my 15 year old showed me the basics in a matter of seconds…how do they learn this stuff?? I’ll be there at the trough, but do I havta wear a bib? It sounds messy. Step aside. I’m diving in. My daughter said “Isn’t she the one who let her kid eat cheerios out of the vacuum cleaner?” You’re famous. We’re holding out for dinner at Dee Dee’s. Do you deliver? VERY IMPRESSIVE. Wow. 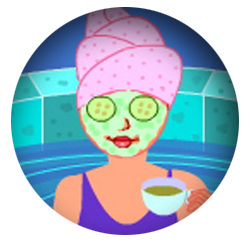 You’re like a TOTAL blog queen now.